Formed in early 2013, Arkansas-based progressive rock band Formals were always keen to eventually release a full-length album. 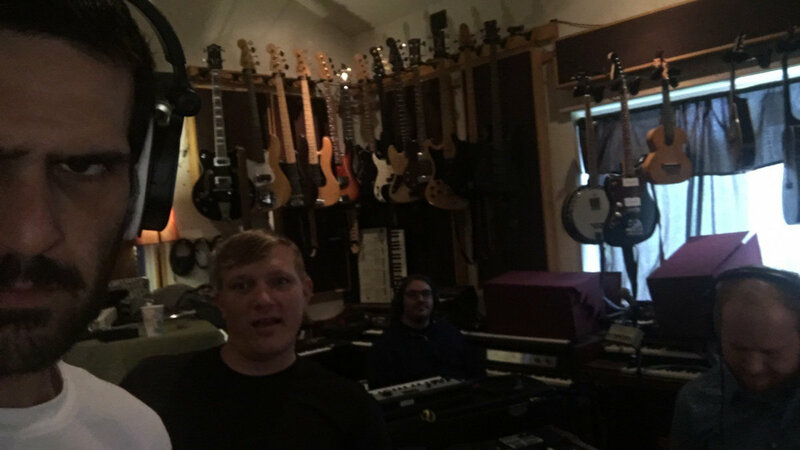 After testing the waters with a couple of pre-release tracks in 2017, they decided to take the plunge and enter the studio to commence work on their debut full-length. The resulting product, ‘Dirtswimming’, effectively showcases a group of eager musicians determined to leave their mark on the unsigned Arkansas music scene. The album confidently kicks off with the seven minute epic ‘Perpetually Coming Down’. Ambient, clean tremolo guitar and warping feedback ambiguously open the track before easing into into a laid-back acoustic groove. The band’s influences are immediately apparent, showcasing a strong Pink Floyd production style and synth lines reminiscent of The Beatles’ later output. The arrangement is particularly notable, making use of the band’s signature octave vocal lines as well as a string synth doubled in octaves. This effectively fills out the more laid-back acoustic arrangement to larger-than-life status. The track closes with an extended set of organ drones, effortlessly leading us into the more upbeat ‘Saint Joe’. This track interestingly features a strong britpop influence; grungy power chords, pounding toms and distorted bass liven up the arrangement in full-force. Particular praise goes to drummer Shawn Newcombe on this track, who truly glues the arrangement together and grasps hold of the track’s momentum as if it’s his for the taking. He’s decorated his drum track with a wide variety of innovative tom beats, which consistently uphold the momentum and form a solid base for the lead guitar work and feedback tracks to gloss over the listener without losing power. ‘I Shoulda Tried Harder’ is a more laid-back track and a fantastic introduction to saxophonist Addison Bunch. Bunch really takes the limelight on this track, crafting a saxophone line that is both melodically innovative yet catchy. The verses are carried by piano, clean guitar, bass and drums. Newcombe fills his drum part with a series of ghost notes, which I felt had a bit of a tendency to draw away from the vocal and piano part at times. That being said, his choice of transitional fills were fantastic and effectively guided the band from section to section. The post-chorus sees Bunch truly shine, launching up the octave and using a range of techniques such as glissando and note bending, bringing the more simplistic arrangement to life and proving himself as a crucial asset to the band. The title track ‘Dirtswimming’ continues in the same vein as the previous track, retaining a much more laid-back vibe. This track showcases the band’s more classic rock influences, strongly alluding to the ‘Use Your Illusion’ albums by Guns N’ Roses. The range of guitar tones on this track are excellent, featuring a range of clean, acoustic and grungy tones to keep the things interesting. A true highlight is the coda section, which opens up into stacked backing vocals and crashing cymbals before fading away to synth, which leads us into ‘Make Peace’. Particular praise goes to vocalist Jordan Ellington’s lyrics on this track, singing ‘Make peace with your old demons/And thank them they got you this far’. His delivery is slightly sarcastic in tone and the double-track, being an octave below, gives it a somewhat resentful tone. This effectively mirrors the thematic content of the lyrics. Instrumentally, the track is based around a catchy, upbeat three-chord progression. I felt Newcombe’s drum track was excellent and certainly an example of ‘playing the song, not the instrument’; a style I’d strongly suggest him to pick up and run with. Warping feedback leads us into the more melancholic, blues-orientated ‘Robert’. This track features some particularly impressive slide guitar work that’s much more delta-blues influenced than previous appearances of slide guitar on this album. At this point, my attention turns to how the material would best work in a live setting. With Ellington handling the vast majority of performance duties including guitar, bass and vocals, it may be worth drafting in additional personnel to create a fully-balanced live sound. Additionally, since the octave double tracks are such a crucial aspect of their sound, I’d strongly advise either Newcombe or Bunch to sing the lower part during live performances. ‘Tooth And Claw’ features in a range of ambient guitar sounds and carries a slight britpop feel. Whilst the band indeed dabble in several different genres across the album, they most certainly possess a set of characteristic traits which include octave backing vocals, 3/4 time signatures and a mix of clean and grungy guitar sections. I’m looking forward to seeing the band perfect their signature traits and channel them into a set style over their next few releases in order to craft a clear-cut sonic identity. ‘Black Fiction’ has a distinct 80’s influence, harking back to bands such as Tears For Fears. Particular praise goes to Ellington for a fantastic picked clean guitar line, something I’d strongly recommend the band continue to feature across the rest of their output. Canon vocals float atop the mix, giving the track a much more easy-listening vibe than a lot of the more attention-grabbing tracks across the rest of the album. ‘Gumption’ sees another return of the britpop influence, with Bunch showcasing yet another fantastically crafted saxophone line. I’d like to see his saxophone lines featured more often in the accompaniment of the band’s material as it does a fantastic job of rounding out the arrangement whilst providing an appropriate counter to the vocal tracks. At this point, my attention turns to the album’s production, which is overall very good. The tracklist is very strong, featuring a rollercoaster-like sequence of upbeat and laid-back tracks. All instruments are well-balanced and no frequencies clash with each other, allowing for a clear-cut mix. The mastering is also a particular highlight, with tracks effortlessly fading into one another and no sudden changes in volume or production style between the songs. ‘I Need My Allowance Early This Week’ is the last laid-back track of the album, with sustained guitar chords accompanying lyrics such as ‘Take your time I’ll be alright/Just don’t come back if you’re high’. I felt these lyrics were widely relatable and distinctly sincere in quality compared to some of the more sarcastic lyrics across the album, showing Ellington’s interesting variety in his lyrical style. The album rounds off with the distinctly upbeat track ‘Taking The Piss’. Newcombe takes the limelight here, constructing his tom part out of a series of impressive tom beats that truly uphold and drive the momentum throughout the track. Whilst his part is undoubtedly busy and attention-grabbing, it works well on this track to fill out the arrangement without becoming overbearing. The track fades away with warping guitar feedback, which I thought was an adequate contrast to the more serene feedback line that opened the album, showing fantastic attention to detail by the band. Overall, ‘Dirtswimming’ is an effective showcase of a talented group of progressive rock musicians looking to carve out their identity in the Arkansas unsigned music scene. They clearly have a good work ethic, good songwriting skills and a desire to push the creative limits. I’m looking forward to seeing how they employ their already-sourced signature traits over their next few releases. Definitely recommended for any progressive rock, ambient or britpop fans.